Sat, Apr 13, 2019, 11:13 pm SL Time, ColomboPage News Desk, Sri Lanka. 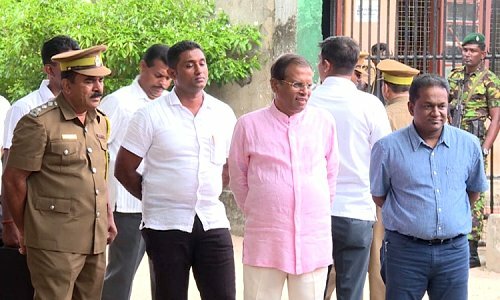 Apr 13, Colombo: President Maithripala Sirisena made an observation visit to the correctional center for youth offenders at Dalupotha in Negombo this evening. The President meeting with the inmates at the correctional center had a mutual discussion with them and inquired into the program being conducted for the rehabilitation of youth inmates. The President attentively listened to few of the inmates relating their grievances and how they became delinquents and instructed the superintendent of the rehabilitation center and other officials how to show them the right path of life. The center through its rehabilitation program prevents the youth and minor offenders from becoming hard criminals and redirects tem into become good citizens. 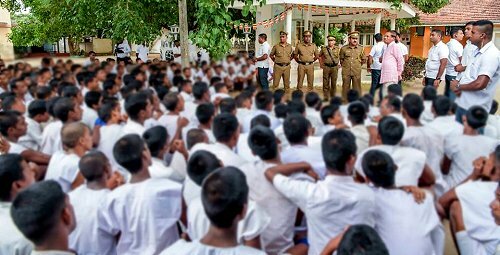 The President also stressed the need to prepare awareness programs continuously to educate the young inmates in this center. The President said that economic and social development programs should be implemented targeting these youth.